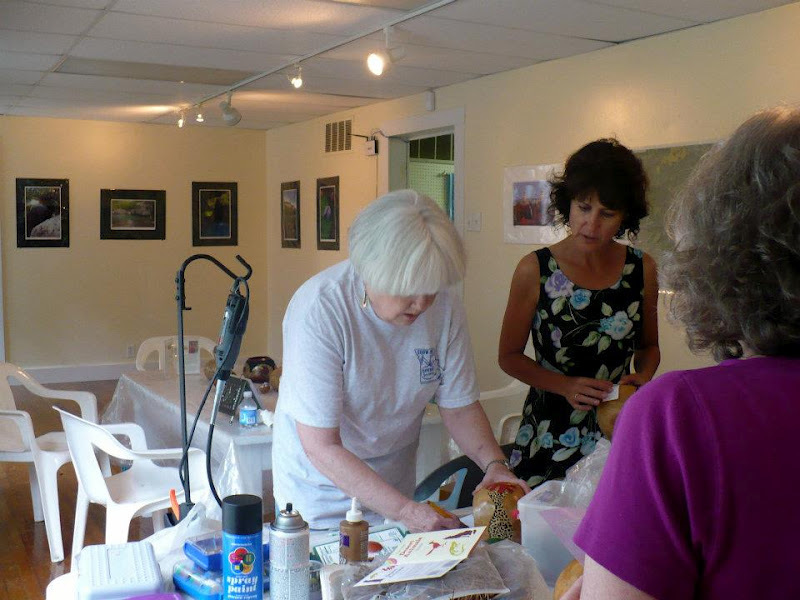 Stone Cottage Adventures: Great Class! 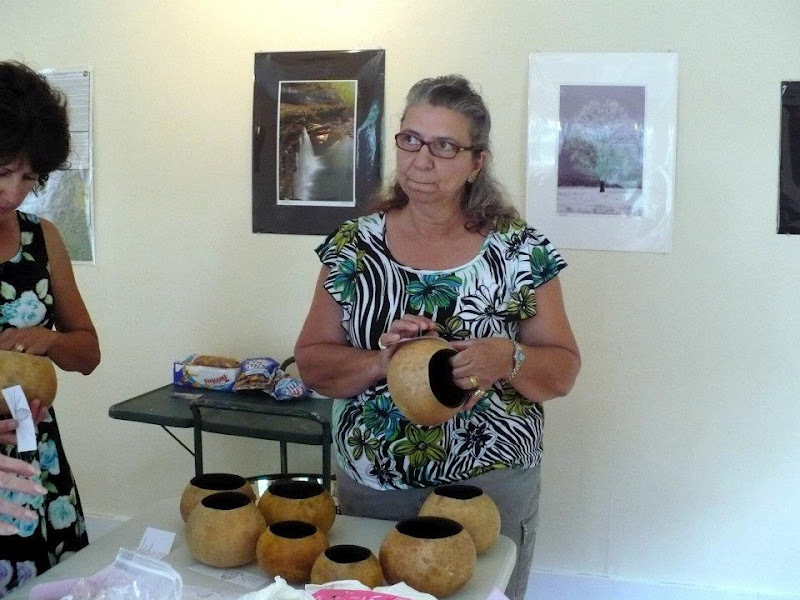 Gourds are easy to grow in our area. For the last couple of years we have grown them and dried them, but didn't really know what to do after that. Well... I was checking the Ozark Folkways Heritage Center Website to see what was on the Calendar. A Gourd Decorating Class!! (I wrote about Ozark Folkways in March. If you would like to read that post, click HERE .) Attending classes at Ozark Folkways Heritage Center is becoming one of my favorite things! It's about an hour away from our home, but well worth the drive. Check out their website HERE for the current Calendar. 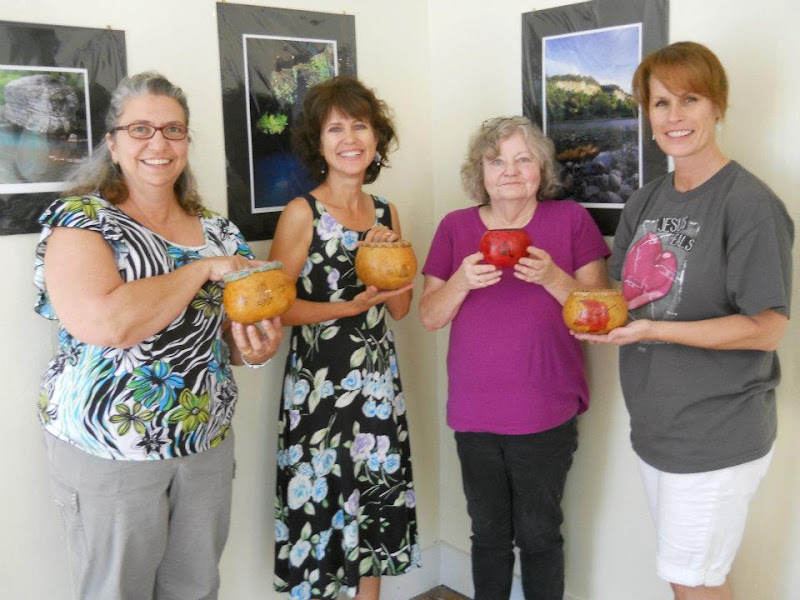 Participating in the Gourd Decorating Class taught by Linda Ashmore was a blast! Linda is a total genius with gourds. You can go to her website HERE . (It's "Out of my Gourd Art" dot com. How funny!) Here are some of her pieces. I know, right? Gorgeous! Absolutely gorgeous! Linda is amazing. In this next photo, we are trying to choose which gourd we would like as well as which stencil. That took us a long time! Linda had brought so many wonderful options, we wanted to make them all! One of the great things about taking a class at Ozark Folkways is that the instructors usually bring everything needed to complete the project. Can you see all the power tools Linda brought? Here we are. The Group Photo! 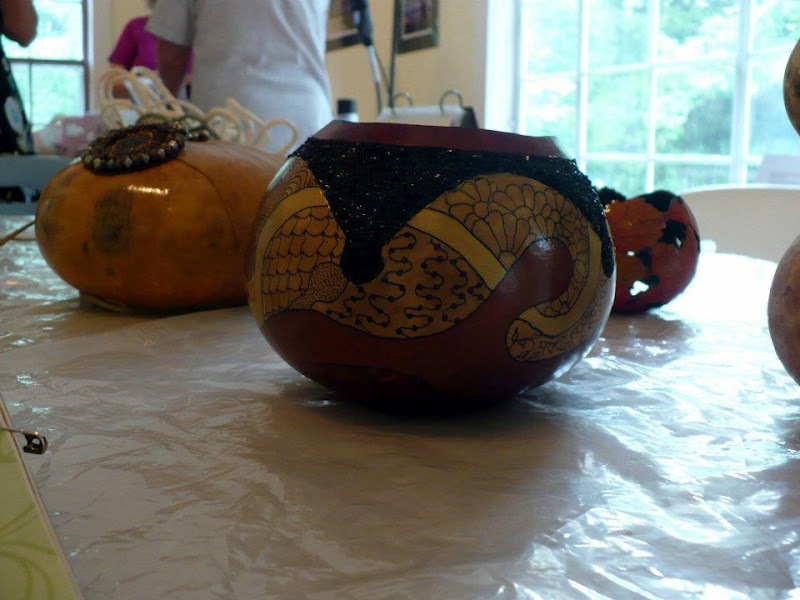 Everyone was able to complete their gourd project before we left. I wish Linda was in the picture with us! She is the photographer for the Group Photo. I don't remember who took the other class pix. Here are some closer pictures of my gourd. I am just all kinds of proud of it! Autumn leaves are so beautiful. For the pattern, I stepped outside and grabbed a maple leaf, then used a wood burner to get the outline on the gourd. Linda recommends finishing the inside with black paint. It's a lovely contrast to the natural wood of the gourd. I love the pine needle weaving on top! We used a dremel to drill the small holes along the top, then our delightful teacher walked us step by step through the weaving process. Linda really squeazed a lot of information into one afternoon! So, now I have a new crafty addiction! Gourd Decorating! Since it's so very easy to grow gourds in our area, I may order more seeds! We have several gourd vines growing in the garden right now. I took the class in hopes of doing something with the ones we have dried. There is a cob-webby pile in the garage. Oh, yeah! Marci, thank you for your wonderful comments. I thoroughly enjoyed spending the afternoon with you ladies. Rebecca and I are discussing another class and I can't wait to get back to Ozark Folkways. wow, it came out so beautifully! thanks for visiting my blog and for your lovely comment on my no sew skirt. got me to visit you. i like it here! Am following you now with google friend connect and would be honored if you would like to follow back, but no hard feelings if not :-). ps: ivan and abigail are adorable! These look great. We don't really have gourds round us here in NZ.